The statistic shows the death rate in the Arab world (Arab League) countries in 2016. In 2016, there were about 11.37 deaths per 1,000 inhabitants in Somalia. 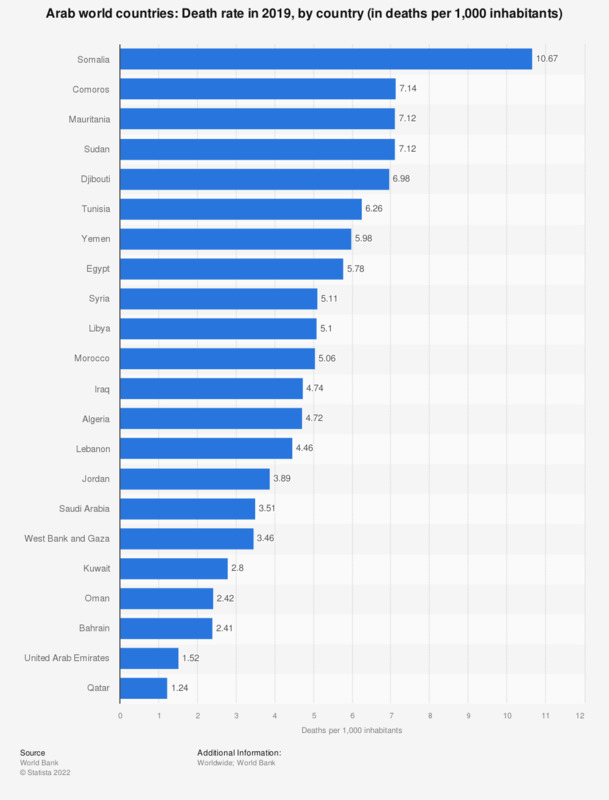 According to source: "Death rate, crude (per 1,000 people)". Algeria, Bahrain, Comoros, Djibouti, Egypt, Iraq, Jordan, Kuwait, Lebanon, Libya, Mauritania, Morocco, Oman, Qatar, Saudi Arabia, Somalia, Sudan, Syrian Arab Republic, Tunisia, United Arab Emirates, West Bank and Gaza (Palestine), Yemen. Statistics on "Demographics of Spain"